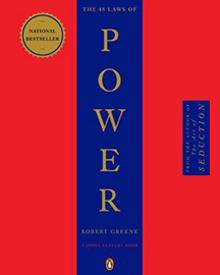 I’m currently reading “The 48 Laws of Power” by Robert Greene, and in Law #4, Always Say Less Than Necessary, Greene tells the story of Gnaeus Marcius, also known as Coriolanus, a fifth century B.C. military hero of ancient Rome. I found it to be quite interesting, and a great example of how saying too much could get you in trouble. Coriolanus was a war hero who won many important battles, saving the city from calamity time and time again. Because he spent most of his time on the battlefield, few Romans knew him personally, which made him something of a legendary figure. In 454 B.C. Coriolanus decided to enter politics, for the high rank of consul. In his first speech before the people, he displayed the dozens of scars he had accumulated over seventeen years of fighting for Rome. Seeing his scars, which were proof of his valor and patriotism, moved the people to tears. It was all but certain he would be elected. On polling day, however, Corialanus entered the forum escorted by the entire senate and the city’s patricians, the aristocracy. The common people who saw this were disturbed by such a blustering show of confidence on election day. When Coriolanus spoke, he addressed mostly the wealthy people who had accompanied him. His words were arrogant and insolent. Claiming certain victory in the vote, he boasted of his battlefield exploits, made sour jokes that appealed only to the patricians, voiced angry accusations against his opponents, and speculated on the riches he would bring to Rome. The people listening realized that this legendary soldier was also a common braggart. News of Coriolanus’ speech spread quickly throughout Rome and people turned out in great numbers to make sure he was not elected. Coriolanus was defeated and returned to the battlefield, bitter and vowing revenge on the common folk who voted against him. Weeks later, when a large shipment of grain arrived in Rome and the senate was preparing to distribute this food to the people for free, Coriolanus appeared on the scene and argued that the distribution would have a harmful effect on the city as a whole. Several senators were won over and the distribution fell into doubt. Coriolanus went on to condemn the concept of democracy itself. He advocated getting rid of the people’s representatives and turning over the governing of the city to the patricians. When news of this latest speech reached the people, riots broke out all over the city, which forced the senate, fearing the wrath of the people, to vote in favour of the grain distribution. The people demanded that Coriolanus speak to them and apologize. If he repented and agreed to keep his opinions to himself, he would be allowed to return to the battlefield. Coriolanus did appear before the people, who listened in silence. He started slowly and softly, but as the speech went on, he became more and more blunt. Yet again he hurled insults! His tone was arrogant, his expression disdainful. The more he spoke, the angrier the people became. Finally he was silenced and condemned to death. The tribunes ordered the magistrates to take him at once to the top of the Tarpeian rock and throw him over. The delighted crowd seconded the decision. The patricians intervened, however, and the sentence was reduced to lifelong banishment. When the people found out that Rome’s great military hero would never return to the city, they celebrated in the streets. In fact, no one had ever seen such a celebration, not even after the defeat of a foreign enemy. Before his entrance into politics, the name of Coriolanus evoked awe. His battlefield accomplishments showed him as a man of great bravery. Since the citizens knew little about him, all kinds of legends became attached to his name. The moment he appeared before the Roman citizens, however, and spoke his mind, all that grandeur and mystery vanished. He bragged and blustered like a common soldier. He insulted and slandered people, as if he felt threatened and insecure. Suddenly, he was not at all what the people had imagined. The discrepancy between the legend and the reality proved immensely disappointing to those who wanted to believe in their hero. The more Coriolanus said, the less powerful he appeared—a person who cannot control his words shows that he cannot control himself, and is unworthy of respect. Had Coriolanus said less, the people would never have had cause to be offended by him, would never have known his true feelings. He would have maintained his powerful aura, would certainly have been elected consul, and would have been able to accomplish his antidemocratic goals. But the human tongue is a beast that few can master. It strains constantly to break out of its cage, and if it is not tamed, it will run wild and cause you grief. Power cannot accrue to those who squander their treasure of words. The above story is given by Greene as an example of a transgression of the law of Always Say Less Than Necessary. He goes on to give an example of how Louis XIV would benefit by observing the law. I’ll leave you with a quote that Greene includes at the end of this story. As always, please feel free to like or comment. Until next time, keep reaching. The branches and leaves of a tree all come from the same place – the tree. The branches are not foolish enough to fight amongst themselves because the tree would eventually die. So it is with humans. We all come from the same place, (Source Energy/Infinite Intelligence/God/The Universe) and until we realize that we are all one and learn to live in harmony, and learn to just live and let live, there can be no peace in the world. Humanity can only flourish if we eliminate hate and judgement. I’m sure you’ve heard someone say, “Well, with my luck, (insert something bad or unwanted here).” Chances are you’ve even said it yourself. While they my seem like harmless words that don’t mean anything, the fact is they do mean something. We should always be aware of our “self-talk”, and what we say and think, because that is what will determine our life experience. Remember: “thoughts become things”. When you say things like, “with my luck, it won’t work out” or, “with my luck, it’ll blow up in my face”, you’re actually saying, “I have bad luck!”, “Nothing ever goes my way!” What happens then is your sub-conscious mind starts to believe what you’re saying, and works on making it a reality. Next time try to catch yourself before you utter that phrase, or better yet, replace the negative with a positive. Say, “With my luck, things will work out perfectly” or, “with my luck, I’ll find exactly what I was looking for at that store.” Just make the last half of that sentence whatever it is that you want. Some food for thought. Stay positive!